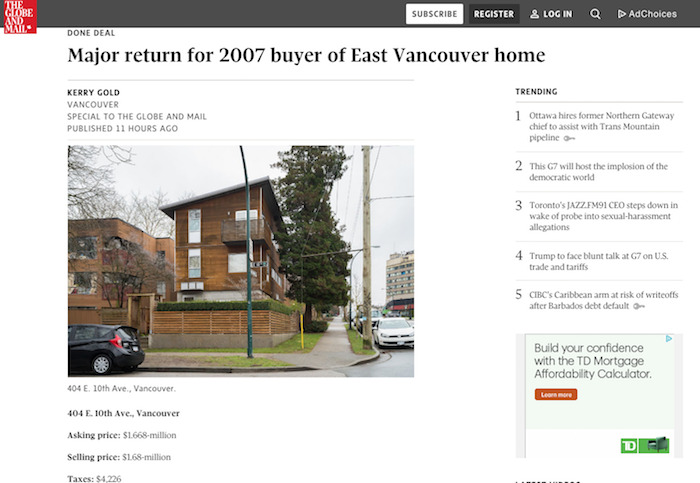 "The agent’s take: “Although it was a high-end duplex and above the average price of a duplex in East Van, the home featured unique architectural design both inside and outside, along with a central location, and tasteful updates throughout,” Mr. Albrighton says. The average price for a duplex in the area is about $1.35 million, he says." Read the full article. The market has changed where there are less sales per listing, however we are still achieving great prices for our owners of unique or architecturally inspiring properties, local buyers still believe in the long-term value of our market. Also rents are strong, holding the value steady of investment properties. This has been our best first-6 months to any year in the past 11 years, so while the media has changed "their perspective" on the market, good product is still holding or increasing in value. See the full property details.